It is the time of the year again to enjoy a hearty barbecue in the backyard with family and friends or to bring out those greasy sunscreens, snorkeling gear, and too-tight swimwear, head straight for the beach, frolic under the sun to bronze perfection and just swim to your hearts’ content. Yes, summer finally has arrived and is really making its presence felt. However, with temperatures soaring to their fiery limits, make sure not to lose your cool under the relentless beat down of the summer sun. Fortunately, the solution does not just involve trapping you in a room with air-conditioning in full blast. The foods listed here will not only leave you feeling hydrated, refresh, light and breezy, it will assist you in replenishing precious electrolytes, vitamins, minerals and water lost from sweating all day, surely, from being involve in activities to make your summertime as memorable as it should be. Herewith, are some of the best foods to chow on this summer. Fruits are generally great as summer foods because majority of them are water rich, filling without the feeling of heaviness and easy to eat. Not to mention they are great sources of anti-oxidants and electrolytes for optimal functioning of the cells of the body. Aside from these benefits, fruits are very versatile and can be prepared or eaten to your liking. Transform them into smoothies, salads or just eaten as is. All the fruits listed below are some of the all-time favorites for summer and are great ammunition in the battle against the heat. Watermelons are 92 % water, full of anti-oxidants, important electrolytes like potassium and magnesium and most importantly, they are delicious. If you’re feeling a little experimental, watermelons can also be paired with other fruits for a succulent salad, made into juice or added to stews and soups. A little History lesson: Did you know that the Ancient Egyptians were gaga for watermelons? Egyptians lived in the Sahara Desert so naturally, water supply was scarce, so they turned to watermelons as an alternative source of water and hydrating fluids. International celebrities like Madonna, Jessica Simpson and Gwyneth Paltrow have discovered the wonders of coconut, especially coconut water. Because of this, some people even dubbed it as “nature’s sports drink”. They swear to the various benefits coconut water have: Improved skin, suppressed appetite and more energy are some of the things they believe coconut water has given them. However, aside from the aforementioned benefits, people from East Asian countries like Thailand, Philippines, India and Vietnam, countries with punishing summers, have already been using coconuts, particularly coconut water, to help victims of diarrhea fight dehydration for many centuries now. In Vietnam, coconut water was even administered intravenously, during the World War II and The Vietnam War to ill and fatigued soldiers and civilians when supplies of I.V fluids were running out of stock. Being isotonic or naturally containing electrolytes, Coconuts and coconut water are rich in Calcium, Magnesium, Potassium, Sodium and Manganese, electrolytes that are vital to the normal and healthy functioning of our bodies, especially in warm weather where we sweat more than the usual. Be it in salads, soups, smoothies, sorbets or just eaten with a small amount of crushed ice, melons and cantaloupes are a cut above the rest when it comes to foods that are great to eat this summer. Aside from the cooling effect they have, fighting high blood pressure, obesity, various skin diseases, rheumatism and arthritis are some of the other benefits you can reap when you regularly eat these summer food favorites. Melons and Cantaloupes are fruits that are especially abundant during the summertime, so do try to take advantage of them this season. Grapes and Berries are not just formidable against cancer; they are also wonderful for snacking and for countering against the heat. Just toss them in the freezer, wait a few hours and voila, frozen natural delights that have smooth, icy texture and cool, fruity taste. Just perfect pickings anytime: in the cool, summer nights or in the sweltering heat of the day. “Ice-creams generally contain around 110 calories in every 100 grams and nearly 5 grams of fat. But that’s just plain vanilla ice-cream. A chocolate and caramel kind of flavour contains anything between 170 calories and 10 grams of fat. A Sorbet contains 100 calories but no fat whatsoever. Sorbets are generally made at home and when available at restaurants are prepared fresh. Ice creams are more preserved over longer periods and contain rarely any vitamins or benefits associated with their fruit content. Still not convinced? There are still excellent reasons why sorbet is better for summer: It is cheaper, can be made at home easily if you want as long as you have a fridge and sorbets have a more subtle and natural flavor than ice cream. When you are looking for a flexible and tasty meal, tacos just might do the job. They are easy to eat, easy to prepare, cheap and can be a complete meal in itself when prepared correctly and thoughtfully. Beef, chicken and pork are the standard fillings but you can use seafood, cheese and vegetables if you feel like it. Taco is not only satiating but also nutritious, as they are usually accompanied with nutrient-packed garnishes like guacamoles, tomatoes, onion, lettuce, and cilantro. Filling and very simple to whip up, Gazpachos are great summer fares. Gazpachos are usually served cold, especially useful in summer and in countries with warm weather throughout the year like Spain, where this dish originated. Usually, tomatoes, which are rich in anti-oxidants and cancer-fighting lycopene, are the base of this dish, but you can add any vegetables like Bell Peppers, Spinach, Cabbage, Cucumbers (like their cousin melons, cucumbers are also well known for their cooling effects) or any vegetable you want and tweak it to your liking. 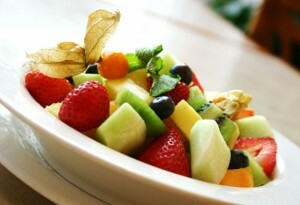 However, you can even whip up a gazpacho made of fruits instead of vegetables if you like. Aside from the ones mentioned above, Mangoes, Avocados, Strawberries and Bananas are some of the fruits you can use to make a uniquely wonderful dish. A healthy salad can be a complete meal in itself like tacos. Besides, cooking in hot weather can be such a chore sometimes. So when the sun is shining a little-too harshly in those summer days, a brightly colored, crisp, nutritious and light salad sometimes does the trick in simultaneously cooling and satiating you and your family. Lettuces, Watercress and Arugula are some of the most popular vegetables in making salads but if you are feeling a little adventurous, you can opt for some Chinese cabbage, Bamboo Shoots, Eggplants or Mushrooms. Whatever you choose, they are all pleasing and refreshing to the palate. This is a guest post on behalf of Crunchlunch.co.uk – Whether you are looking for Pizza Hut Vouchers or Nandos Vouchers, Crunchlunch.co.uk has it covered.